You may not know my name. My face may not be recognizable to you in a crowd. The only time we may have ever exchanged words was most likely a causal "hello" at the grocery store checkout line. And that is why what I am about to say next may come as a shock. Yes, YOU are my village. You who only knows me from the school drop off line. You who waves at me from your front porch as I take my girls on an evening walk. You who never once asked to be a part of my village. As random as it may be, I need you. My family needs you. My youngest daughter needs you too. If you are anything like me, you are busy...super busy. There is not enough time in your day to do all of the many things you need to do. There are children to care for, bills to pay, a job to go to, a house to tend to...the list is enormous. And that's why I (almost) feel kinda, sorta guilty asking you for anything. But I also know that if you are anything like me, you know that one of the most valuable investments we can make is in our children. And you know that our children are our future. That when we allow even one of them to get lost, we are allowing the brightest and most promising part of our future to be lost too. You also know that it takes a village -- to raise our children and to make a difference. And that is why I am writing to you -- my village -- today. I need your help. Governor Rauner has proposed cutting 23M from the Early Intervention budget. This means that children with a developmental delay of less than 50% will no longer be able to receive services. One of those children is my daughter, Ceci. And since you are my village, she is your kiddo too. Please take the time to write to your legislators and let them know that Early Intervention is the LAST place cuts should be made. Because if these cuts are made, OUR village will be hurt. Since your time is valuable, below is a letter you can use. And as always, thank you -- for your time, your smiles, your waves, your support and for proving how powerful a village can be. I am writing to urge you to reconsider your proposed cuts and policy changes to programs serving our state’s most vulnerable children and families. I firmly believe these cuts and policy changes are not cost-effective, and will, over time, result in increased spending in a number of areas. I am most concerned about your proposal to significantly restrict eligibility for Early Intervention (EI) services for infants and toddlers with developmental delays by making it impossible for children with mild to moderate delays to access services. Increasing the percentage of delay required for eligibility from 30% to 50% will deny services to thousands of children and families in IL – eliminating more than half of the children from receiving services. This change will not save money; rather, it will result in higher special education costs for these children in preschool, kindergarten and beyond as their delays become more severe without intervention. 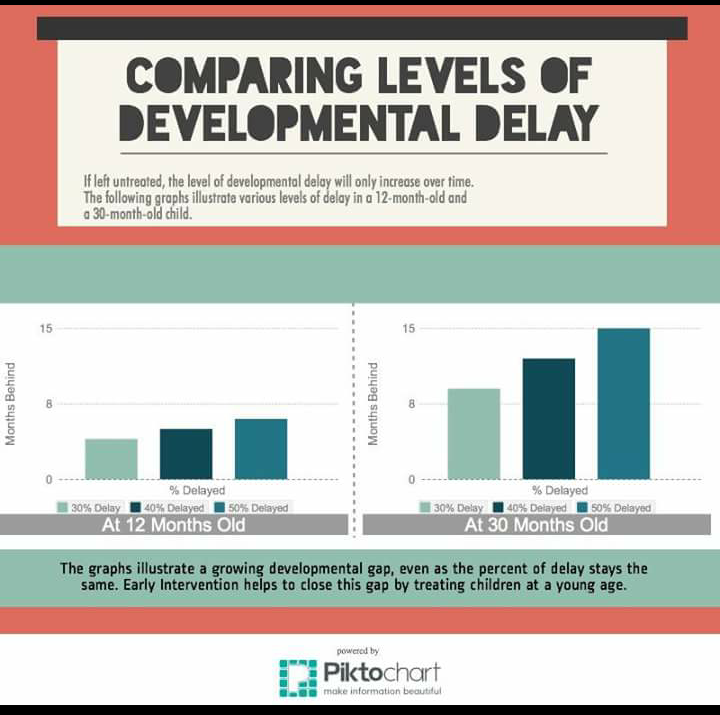 Studies show that children with mild and moderate delays receive the most benefit from Early Intervention and are more likely to close the developmental gap. 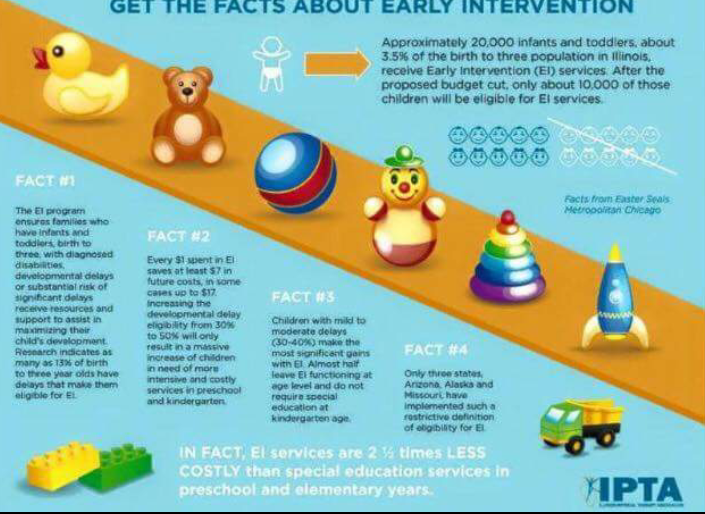 Restricting eligibility for EI services will undermine your commitment to early childhood education and make it more difficult for parents, pediatricians and early childhood professionals to find the critical supports that children with developmental delays need to have a healthy start. Perfect. Couldn't have said it better myself!